Ralph Waldo Emerson. (1803–1882). Essays and English Traits. 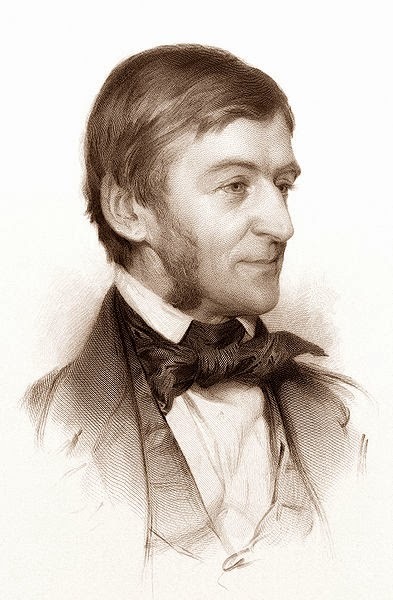 Emerson startled the world by fearlessly declaring his beliefs. Such apparent paradoxes as we find in his inspirational essay, "Heroism," makes him the most stimulating yet profound thinker America has produced. Paradise is under the shadow of swords. Valerius. Bid thy wife farewell. Mar. Dost know what ’t is to die? And prove thy fortitude what then ’t will do. Or Martius’ heart will leap out at his mouth. His soul hath subjugated Martius’ soul. And Martius walks now in captivity. I do not readily remember any poem, play, sermon, novel or oration that our press vents in the last few years, which goes to the same tune. We have a great many flutes and flageolets, but not often the sound of any fife. Yet Wordsworth’s “Laodamia,” and the ode of “Dion,” and some sonnets, have a certain noble music; and Scott will sometimes draw a stroke like the portrait of Lord Evandale given by Balfour of Burley. Thomas Carlyle, with his natural taste for what is manly and daring in character, has suffered no heroic trait in his favorites to drop from his biographical and historical pictures. Earlier, Robert Burns has given us a song or two. In the Harleian Miscellanies there is an account of the battle of Lutzen which deserves to be read. And Simon Ockley’s History of the Saracens recounts the prodigies of individual valor, with admiration all the more evident on the part of the narrator that he seems to think that his place in Christian Oxford requires of him some proper protestations of abhorrence. But if we explore the literature of Heroism we shall quickly come to Plutarch, who is its Doctor and historian. To him we owe the Brasidas, the Dion, the Epaminondas, the Scipio of old, and I must think we are more deeply indebted to him than to all the ancient writers. Each of his “Lives” is a refutation to the despondency and cowardice of our religious and political theorists. A wild courage, a stoicism not of the schools but of the blood, shines in every anecdote, and has given that book its immense fame. We need books of this tart cathartic virtue more than books of political science or of private economy. Life is a festival only to the wise. Seen from the nook and chimney-side of prudence, it wears a ragged and dangerous front. The violations of the laws of nature by our predecessors and our contemporaries are punished in us also. The disease and deformity around us certify the infraction of natural, intellectual and moral laws, and often violation on violation to breed such compound misery. A lockjaw that bends a man’s head back to his heels; hydrophobia that makes him bark at his wife and babes; insanity that makes him eat grass; war, plague, cholera, famine, indicate a certain ferocity in nature, which, as it had its inlet by human crime, must have its outlet by human suffering. Unhappily almost no man exists who has not in his own person become to some amount a stockholder in the sin, and so made himself liable to a share in the expiation. Our culture therefore must not omit the arming of the man. Let him hear in season that he is born into the state of war, and that the commonwealth and his own well-being require that he should not go dancing in the weeds of peace, but warned, self-collected and neither defying nor dreading the thunder, let him take both reputation and life in his hand, and with perfect urbanity dare the gibbet and the mob by the absolute truth of his speech and the rectitude of his behavior. Towards all this external evil the man within the breast assumes a warlike attitude, and affirms his ability to cope single-handed with the infinite army of enemies. To this military attitude of the soul we give the name of Heroism. Its rudest form is the contempt for safety and ease, which makes the attractiveness of war. It is a self-trust which slights the restraints of prudence, in the plenitude of its energy and power to repair the harms it may suffer. The hero is a mind of such balance that no disturbances can shake his will, but pleasantly and as it were merrily he advances to his own music, alike in frightful alarms and in the tipsy mirth of universal dissoluteness. There is somewhat not philosophical in heroism; there is somewhat not holy in it; it seems not to know that other souls are of one texture with it; it hath pride; it is the extreme of individual nature. Nevertheless we must profoundly revere it. There is somewhat in great actions which does not allow us to go behind them. Heroism feels and never reasons, and therefore is always right; and although a different breeding, different religion and greater intellectual activity would have modified or even reversed the particular action, yet for the hero that thing he does is the highest deed, and is not open to the censure of philosophers or divines. It is the avowal of the unschooled man that he finds a quality in him that is negligent of expense, of health, of life, of danger, of hatred, of reproach, and that he knows that his will is higher and more excellent than all actual and all possible antagonists. Heroism works in contradiction to the voice of mankind and in contradiction, for a time, to the voice of the great and good. Heroism is an obedience to a secret impulse of an individual’s character. Now to no other man can its wisdom appear as it does to him, for every man must be supposed to see a little farther on his own proper path than any one else. Therefore just and wise men take umbrage at his act, until after some little time be past: then they see it to be in unison with their acts. All prudent men see that the action is clean contrary to a sensual prosperity; for every heroic act measures itself by its contempt of some external good. But it finds its own success at last, and then the prudent also extol. Citizens, thinking after the laws of arithmetic, consider the inconvenience of receiving strangers at their fireside, reckon narrowly the loss of time and the unusual display: the soul of a better quality thrusts back the unseasonable economy into the vaults of life, and says, I will obey the God, and the sacrifice and the fire he will provide. Ibn Hankal, the Arabian geographer, describes a heroic extreme in the hospitality of Sogd, in Bukharia. “When I was in Sogd I saw a great building, like a palace, the gates of which were open and fixed back to the wall with large nails. I asked the reason, and was told that the house had not been shut, night or day, for a hundred years. Strangers may present themselves at any hour and in whatever number; the master has amply provided for reception of the men and their animals and is never happier than when they tarry for some time. Nothing of the kind have I seen in any other country.” The magnanimous know very well that they who give time, or money, or shelter, to the stranger,—so it be done for love and not for ostentation,—do, as it were, put God under obligation to them, so perfect are the compensations of the universe. In some way the time they seem to lose is redeemed and the pains they seem to take remunerate themselves. These men fan the flame of human love and raise the standard of civil virtue among mankind. But hospitality must be for service and not for show, or it pulls down the host. The brave soul rates itself too high to value itself by the splendor of its table and draperies. It gives what it hath, and all it hath, but its own majesty can lend a better grace to bannocks and fair water than belong to city feasts. The temperance of the hero proceeds from the same wish to do no dishonor to the worthiness he has. But he loves it for its elegancy, not for its austerity. It seems not worth his while to be solemn and denounce with bitterness flesh-eating or wine-drinking, the use of tobacco, or opium, or tea, or silk, or gold. A great man scarcely knows how he dines, how he dresses, but without railing or precision his living is natural and poetic. John Eliot, the Indian Apostle, drank water, and said of wine, “It is a noble, generous liquor and we should be humbly thankful for it, but, as I remember, water was made before it.” Better still is the temperance of King David, who poured out on the ground unto the Lord the water which three of his warriors had brought him to drink, at the peril of their lives. It is told of Brutus, that when he fell on his sword after the battle of Philippi, he quoted a line of Euripides, “O Virtue! I have followed thee through life, and I find thee at last but a shade.” I doubt not the hero is slandered by this report. The heroic soul does not sell its justice and its nobleness. It does not ask to dine nicely and to sleep warm. The essence of greatness is the perception that virtue is enough. Poverty is its ornament. Plenty does not need it, and can very well abide its loss. Jul. Why, slaves, ’t is in our power to hang ye. ’T is in our powers, then, to be hanged, and scorn ye. These replies are sound and whole. Sport is the bloom and glow of a perfect health. The great will not condescend to take any thing seriously; all must be as gay as the song of a canary, though it were the building of cities or the eradication of old and foolish churches and nations which have cumbered the earth long thousands of years. Simple hearts put all the history and customs of this world behind them, and play their own play in innocent defiance of the Blue-Laws of the world; and such would appear, could we see the human race assembled in vision, like little children frolicking together, though to the eyes of mankind at large they wear a stately and solemn garb of works and influences. The interest these fine stories have for us, the power of a romance over the boy who grasps the forbidden book under his bench at school, our delight in the hero, is the main fact to our purpose. All these great and transcendent properties are ours. If we dilate in beholding the Greek energy, the Roman pride, it is that we are already domesticating the same sentiment. Let us find room for this great guest in our small houses. The first step of worthiness will be to disabuse us of our superstitious associations with places and times, with number and size. Why should these words, Athenian, Roman, Asia and England, so tingle in the ear? Let us feel that where the heart is, there the muses there the gods sojourn, and not in any geography of fame. Massachusetts, Connecticut River and Boston Bay you think paltry places, and the ear loves names of foreign and classic topography. But here we are:—that is a great fact, and, if we will tarry a little, we may come to learn that here is best. See to it only that thyself is here,—and art and nature, hope and dread, friends, angels and the Supreme Being shall not be absent from the chamber where thou sittest. Epaminondas, brave and affectionate, does not seem to us to need Olympus to die upon, nor the Syrian sunshine. He lies very well where he is. The Jerseys were handsome ground enough for Washington to tread, and London streets for the feet of Milton. A great man illustrates his place, makes his climate genial in the imagination of men, and its air the beloved element of all delicate spirits. That country is the fairest which is inhabited by the noblest minds. The pictures which fill the imagination in reading the actions of Pericles, Xenophon, Columbus, Bayard, Sidney, Hampden, teach us how needlessly mean our life is; that we, by the depth of our living, should deck it with more than regal or national splendor, and act on principles that should interest man and nature in the length of our days. We have seen or heard of many extraordinary young men who never ripened, or whose performance in actual life was not extraordinary. When we see their air and mien, when we hear them speak of society, of books, of religion, we admire theirs superiority; they seem to throw contempt on the whole state of the world; their is the tone of a youthful giant who is sent to work revolutions. But they enter an active profession and the forming Colossus shrinks to the common size of man. The magic they used was the ideal tendencies, which always makes the Actual ridiculous; but the tough world has its revenge the moment they put their horses of the sun to plough in its furrow. They found no example and no companion, and their heart fainted. What then? The lesson they gave in their first aspirations is yet true; and a better valor and a purer truth shall one day execute their will and put the world to shame. Or why should a woman liken herself to any historical woman, and think, because Sappho, or Sévigné, or De Staël, or the cloistered souls who have had genius and cultivation do not satisfy the imagination and the serene Themis, none can,—certainly not she. Why not? She has a new and unattempted problem to solve, perchance that of the happiest nature that ever bloomed. Let the maiden, with erect soul, walk serenely on her way, accept the hint of each new experience, try in turn all the gifts God offers her that she may learn the power and the charm that like a new dawn radiating of the deep of space, her new-born being is. The fair girl who repels interference by a decided and proud choice of influences, so careless of pleasing, so wilful and lofty, inspires every beholder with somewhat of her own nobleness. The silent heart encourages her; O friend, never strike sail to a fear. Come into port greatly, or sail with God the seas. Not in vain you live, for every passing eye is cheered and refined by the vision. The characteristic of genuine heroism, is its persistency. All men have wandering impulses, fits and starts of generosity. But when you have resolved to be great, abide by yourself, and do not weakly try to reconcile yourself with the world. The heroic cannot be the common, nor the common the heroic. Yet we have the weakness to expect the sympathy of people in those actions whose excellence is that they outrun sympathy and appeal to a tardy justice. If you would serve your brother it is fit for you to serve him, do not take back your words when you find that prudent people do not commend you. Be true to your own act, and congratulate yourself if you have done something strange and extravagant and broken the monotony of a decorous age. It was a high counsel that I once heard given to a young person, “Always do what you are afraid to do.” A simple manly character need never make an apology, but should regard its past action with the calmness of Phocion, when he admitted that the event of the battle was happy, yet did not regret his dissuasion from the battle. There is no weakness or exposure for which we cannot find consolation in the thought,—this is a part of my constitution, part of my relation and office to my fellow-creature. Has nature covenanted with me that I should never appear to disadvantage, never make a ridiculous figure? Let us be generous of our dignity as well as of our money. Greatness once and for ever has done with opinion. We tell our charities, not because we wish to be praised for them, not because we think they have great merit, but for our justification. It is a capital blunder; as you discover when another man recites his charities. To speak the truth, even with some austerity, to live with some rigor of temperance, or some extremes of generosity, seems to be an asceticism which common good nature would appoint to those who are at ease and in plenty, in sign that they feel a brotherhood with the great multitude of suffering men. And not only need we breathe and exercise the soul by assuming the penalties of abstinence, of debt, of solitude, of unpopularity, but it behooves the wise man to look with a bold eye into those rarer dangers which sometimes invade men, and to familiarize himself with disgusting forms of disease, with sounds of execration, and the vision of violent death. Times of heroism are generally times of terror, but the day never shines in which this element may not work. The circumstances of man, we say, are historically somewhat better in this country and at this hour than perhaps ever before. More freedom exists for culture. It will not now run against an axe at the first step out of the beaten track of opinion. But whoso is heroic will always find crises to try his edge. Human virtue demands her champions and martyrs, and the trial of persecution always proceeds. It is but the other day that the brave Lovejoy gave his breast to the bullets of a mob, for the rights of free speech and opinion, and died when it was better not to live. I see not any road of perfect peace which a man can walk, but to take counsel of his own bosom. Let him quit too much association, let him go home much, and establish himself in those courses he approves. The unremitting retention of simple and high sentiments in obscure duties is hardening the character to that temper which will work with honor, if need be in the tumult, or on the scaffold. Whatever outrages have happened to men may befall a man again: and very easily in a republic, if there appear any signs of a decay of religion. Coarse slander, fire, tar and feathers and the gibbet, the youth may freely bring home to his mind and with what sweetness of temper he can, and inquire how fast he can fix his sense of duty, braving such penalties, whenever it may please the next newspaper and a sufficient number of his neighbors to pronounce his opinions incendiary. Thou art quiet in thy grave. In the gloom of our ignorance of what shall be, in the hour when we are deaf to the higher voices, who does not envy them who have seen safely to an end their manful endeavor? Who that sees the meanness of our politics but inly congratulates Washington that he is long already wrapped in his shroud, and for ever safe; that he was laid sweet in his grave, the hope of humanity not yet subjugated in him? Who does not sometimes envy the good and brave who are no more to suffer from the tumults of the natural world, and await with curious complacency the speedy term of his own conversation with finite nature? And yet the love that will be annihilated sooner than treacherous has already made death impossible, and affirms itself no mortal but a native of the deeps of absolute and inextinguishable being.